producing optimized product feeds while providing a range of tools for extreme customization. VersaFeed continually experiments with new formats, optimizations, and account configurations to ensure high quality feeds and maximum ROI. VersaFeed's proprietary Feed Modification interfaces enable clients to create automated rules for editing any field, of any item, in any feed. VersaFeed actively monitors product data imports, feed uploads, and data quality reports to ensure clients have maximum visibility and coverage. A complete set of tools, designed for power users. in the ever-changing ecommerce sphere. VersaFeed pulls from source feeds, databases, ecommerce platforms, even website crawls. View and change how source fields map into our internal database and feed fields. Custom rules and auto matching ensure products are accurately categorized per destination. 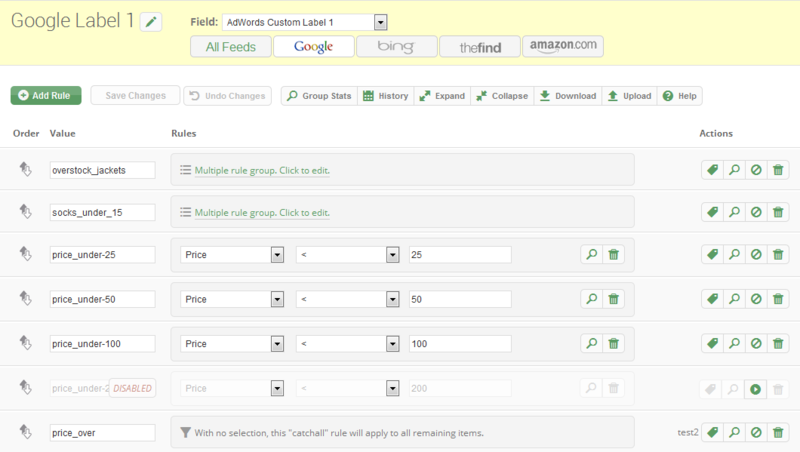 Easily modify any field in any feed with automated rules using a sophisticated user interface. A framework of robust selection rules provide familiar interfaces for each tool application. Remove products on the fly to alleviate policy restrictions and accommodate business rules. Import up-to-date product data on demand to analyze new feed modifications and other rules. An innovative tool to view changes to your data over time, compare various fields per date. Monitor, diagnose, and fix critital issues and trends, pulled directly from your Google accounts. The power of VersaFeed at your fingertips. Freeform Advanced modifications on any field in any feed. Rules execute on all items. Single Field All rules apply to a single field of choice. Each item will match only one rule. Modify any field in any feed. Freeform mods can range from basic to highly advanced, with a large variety of modifications, including set, find & replace, calculations, and complex regular expressions. All rules execute on all items. Dynamically create new fields for use with other feed modifications and interfaces. An efficient way to segment your product data for Google Shopping Campaigns. All rules are applied to a single product attribute. Rules are executed from top to bottom, while each item can only match one rule. The items cascade from one rule onto the next until each match is found. Select from above to see a sample of each feed modification interface. Target products with extreme granularity and perform hi-tech operations on your data. 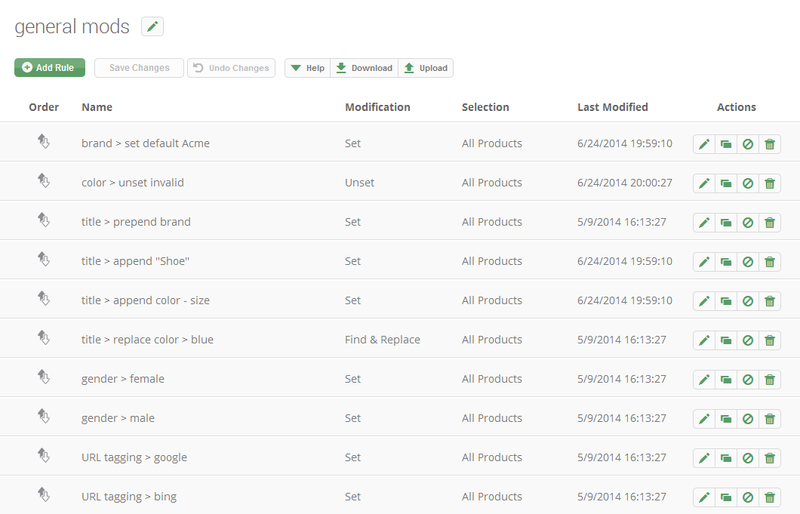 Compound and nested rules allow item selections based on many different product criteria at once. A flexible modification interface provides an intuitive tool for simple to complex transformations. The modification rules consist of an arbitrary name, product selection, the edit rule, and applicable feeds. We provide every kind of selection technique imaginable for endless manipulation of your data. If you can think of another way to segment your data, we'll add it! VersaFeed provides various features which cater to agencies and third-party consultants alike. Multi-client account linkages, bulk account discounts, and file-based rulesets for quick edits across multiple accounts.